I have been involved with pest control in Saddleworth for many years and recently I had an influx of calls from people who had a wasps nest problem. I was called out to three domestic properties where the wasp nests were all in the roof space. Wasps will find entry into the tiniest of spaces, that’s why it is important to make sure all potential entry points are sealed. If you have a Saddleworth wasps nest problem give me a call on 07940 062670 I can be with you within the hour. The first pest control in Saddleworth problem I attended was in Denshaw, where the lady of the house was really distressed at finding the need to call out a pest control technician. However, she was soon placated when I assured her that my vehicle wasn’t sign written and the wasps nest problem could be easily dealt with. After this first pest control problem in Saddleworth I had to divert to an ant control problem in Royton, Oldham. 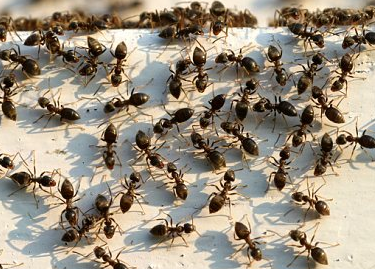 The householder telephoned to say that he had found ants inside his fridge and in his kitchen cupboards. The fridge had a faulty door seal which meant that the ants, looking for high protein and sugary food, had found an easy source. They were gaining entry to the kitchen via the new sink waste pipe that had been fitted but not pointed on the external wall, or plastered on the internal wall, leaving quite a visible entry point. I would image his plumber would be getting an ear bashing later. Next it was back to the other two problems with pest control in Saddleworth and quickly dealing with the wasp nests there. It was proving to be another busy week with pest control problems in Tameside, Oldham and Glossop. Perhaps the funniest call out for pest control was in Hyde, Tameside where I investigated a roof space noise. The tenant had apparently asked his landlord to sort out the problem and frustrated at his inaction, had finally called me to investigate the roof space noise. Suspecting rats, mice, birds or even squirrels it turned out to be heat expansion noises due to the current hot weather. If you have a pest control problem in Saddleworth, Tameside, Oldham, Glossop, Stockport or Manchester give me a call on 07940 062670. I offer a speedy, affordable service and your pest or infestation problem will soon be solved.